Bernard Lietaer, who has been a very prolific author this year, has always argued for an ecology of currencies. In a very short youtube clip he notes that the chief economist of Deutschebank is advocating Greece keeps the drachma and has the Euro as well. It has always been a case of either in the Euro or out of the Euro. I have always said the either/or solution must be replaced by a both/and solution. Bernard is also recommending the country gives power to the cities to have their own currencies and this will also solve the tax problem. After all, when you have your own local currency for ordinary transactions, it saves your precious national currency for paying your taxes. His most recent book is the Club of Rome report Money and Sustainability – the Missing Link with authors Christian Arnsperger, Sally Groener and Stefan Brunnhuber. 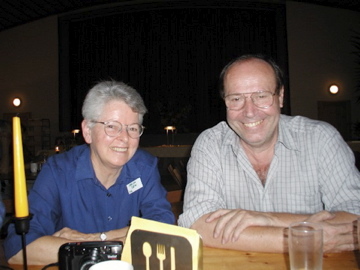 He is seen here in 2003 in Steyerberg, Germany with Helen Dew of Living Economies. You can see and read more from Bernard Lietaer on his website. He also has his TED talks on his site. This entry was posted in Eco monetary reform and tagged drachma, Euro, Eurozone, Greece, mutliple currencies, taxes by Deirdre. Bookmark the permalink.